Arillyn Moran-Lawrence has two landscapes hanging at the Southern California Artists’ Association gallery show from December 5 – 27. The studio is located at 3251 Laguna Canyon Road, Suite F3, in Laguna Beach, CA. Julie S. Ljubenkov will teach a class entitled, “Eye on Nature” a beginning watercolor class in the San Diego area from January 21 – March 18 from 6:00 to 9:00 p.m. If you are interested, call 858-534-3400 or go online for further information. Julie also reports that her home is now rebuilt and she is living back on her property. Download her newsletter JulieNewsWinterSpring09-10 to read more. 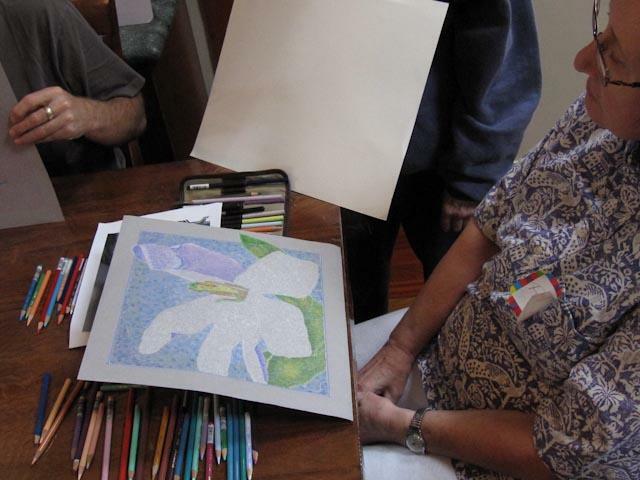 A three-day workshop in colored pencil was held at the home of Margaret Lindsey this past November. 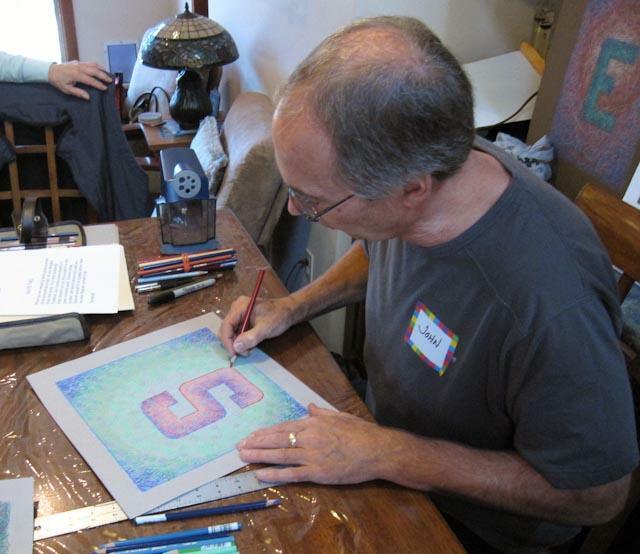 The instructor was John Smolko, a well known artist who uses scribbled lines to produce his award-winning paintings. 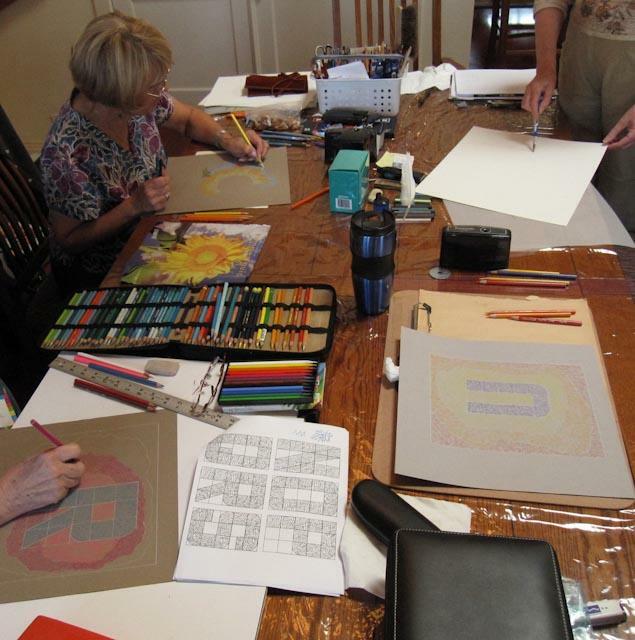 Several BAGSC members were part of the group: Joan Reeves, Rita Hopper, Sue Kuuskmae, and Morgan Kari. John painted a large portrait during the three days, which was won by Morgan in a drawing that was held on the final day of classes. Sue working at the John Smolko Workshop. 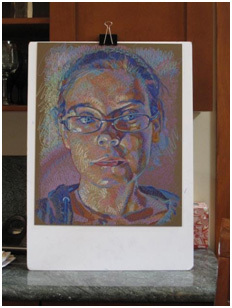 The newly formed Pastel Society of Southern California is sponsoring a two-day workshop by artist and teacher, Mary Aslin, on February 26 – 27 to be held at the Graphaids in Westchester. Mary hails from Laguna Beach where she has her studio and you can see her art work on her web site. If you are interested in taking part in this workshop, contact Sue Kuuskmae. I hope you all enjoyed the Christmas Party held at Janice Sharp’s house and that the year 2010 is a productive one for all of us.